The other day I was at the Kroger on West Gray, grabbing a few things for my parents. Because I have this disease where I cannot exit a grocery store without a bottle or three of wine in my hand, there was some malbec thrown in there for good measure. Long story long, the grocer had an oops moment and dropped the bottle of malbec, which shattered in dramatic fashion all over the floor. Cranky Woman: (walks in, looks at the wine, scrunches up her nose) Smells like wine in here. Non-cranky woman: (walking out, looks at the wine) Oh, that's just unfortunate. Me: (laughing) Yes it is. 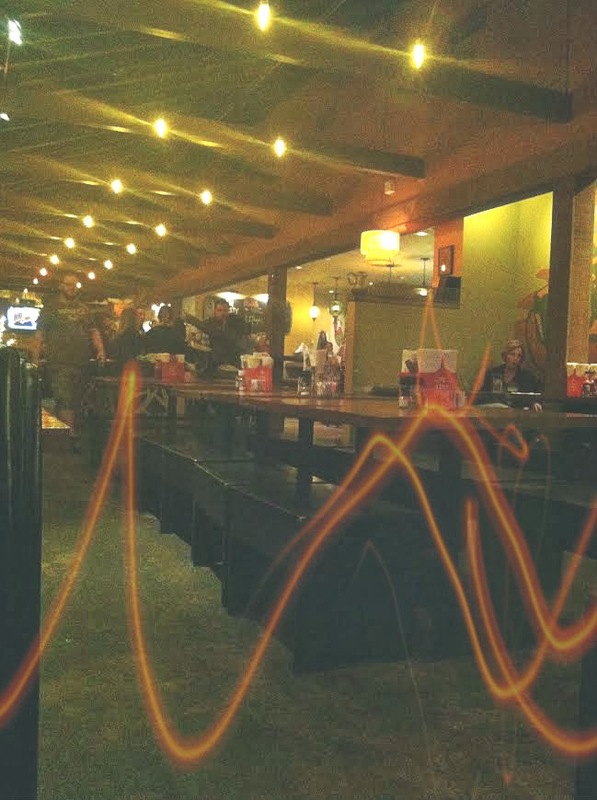 Now before I get to Person #3, you guys know how Américas is my favorite restaurant in Houston? Well, it is without a shadow of a doubt my favorite restaurant in Houston. David Cordúa: (stops, looks at the wine) Oh, that is just the saddest sight I've ever seen! Me: (gapes awkwardly and has seemed to have lost any ability to speak). So I shared a moment with David Cordúa. Okay, I almost shared a moment with David Cordúa. It was more he was all awesome and stuff, and I stood there like a noodle. But there it is! Do you forgive me now for my lack of blog posts in the month of February? A few weeks ago (okay a month ago, let's be real I'm way behind here), my best friend Courtney came down to visit from NYC. And it very well might have been the best weekend of my life, no lie. While I was sure to take her to a bunch of my faves (El Tiempo, Brasil, Torchy's, Spec's and Underbelly), at the suggestion of my friend Lenny, we had dinner at Beaver's in the Heights one night. Y'all. Y'ALL. This is a Houston staple, and I cannot believe this was the first time I'd been there. 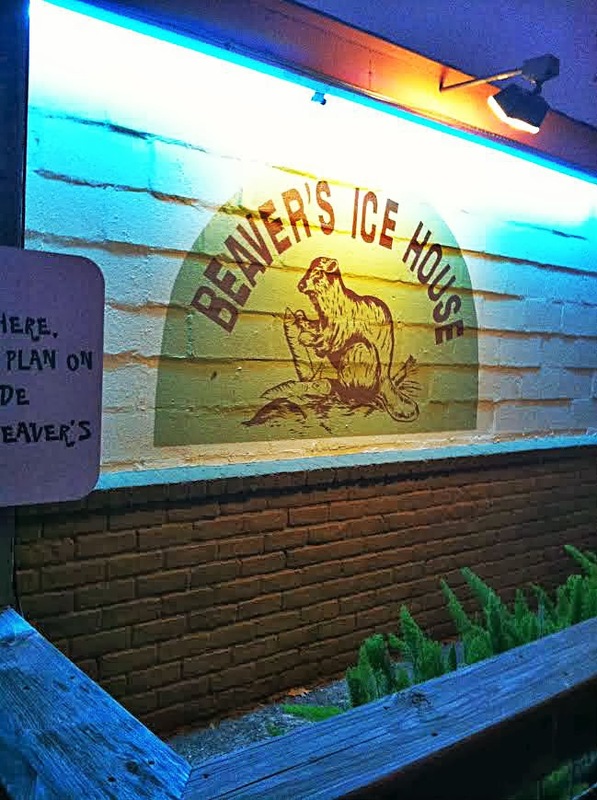 Beaver's kind of looks like a place that would have just standard pub fare (aside from all of the immature - and by immature I mean HILARIOUS - beaver jokes plastered everywhere). But the food most certainly is not standard pub fare. To start, we ordered the Tots 'N Shots to split. 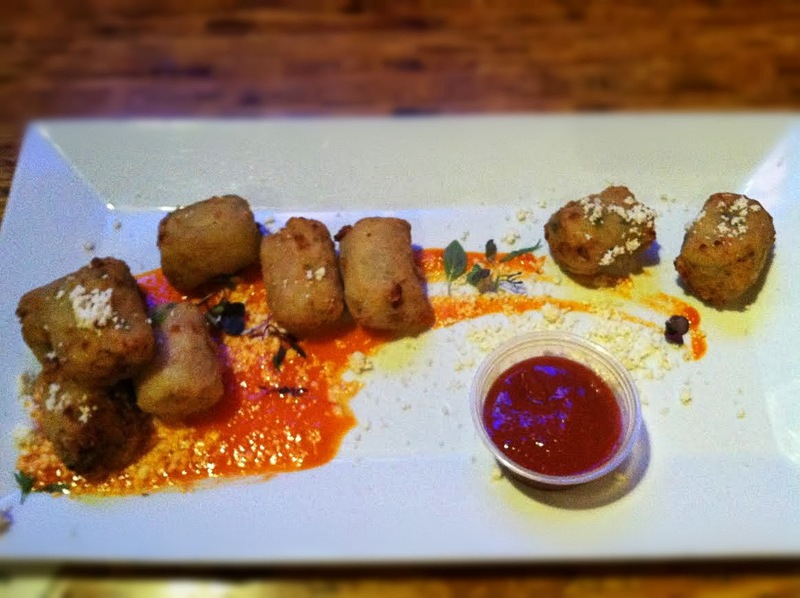 Green chile pimento cheese risotto tots with BLOODY MARY dipping sauce, are you kidding me with this? They were absolutely magnificent. The cheese oozed out of the tots in perfect harmony with the risotto, and the bloody mary dipping sauce offered a tangier more flavorful alternative to the standard marinara or ketchup. Because I felt it important that Courtney sample some true Texas staples, she ordered the Smoker Sampler, and I ordered the Chicken Fried (Beaver) Steak. When I said the words "chicken fried steak," she looked at me like I had three heads. Psh, Northerners. But she loved the CFBS! And this was a pretty darn good chicken fried steak. Tasty BACON gravy (dear lord) that didn't make the breading soggy (we Texans know what that's like, ammiright? 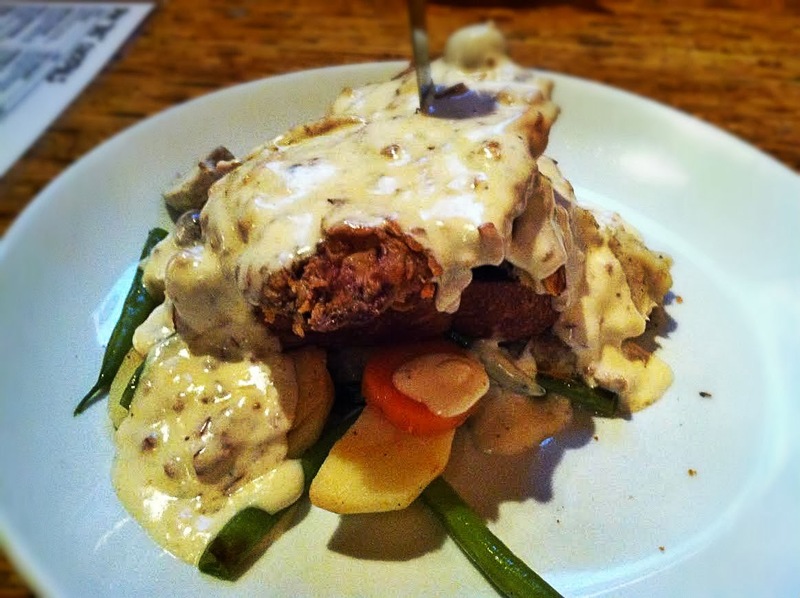 ), covering a hearty helping of fried steak. It was absolutely awesome and totally healthy because it came with vegetables! 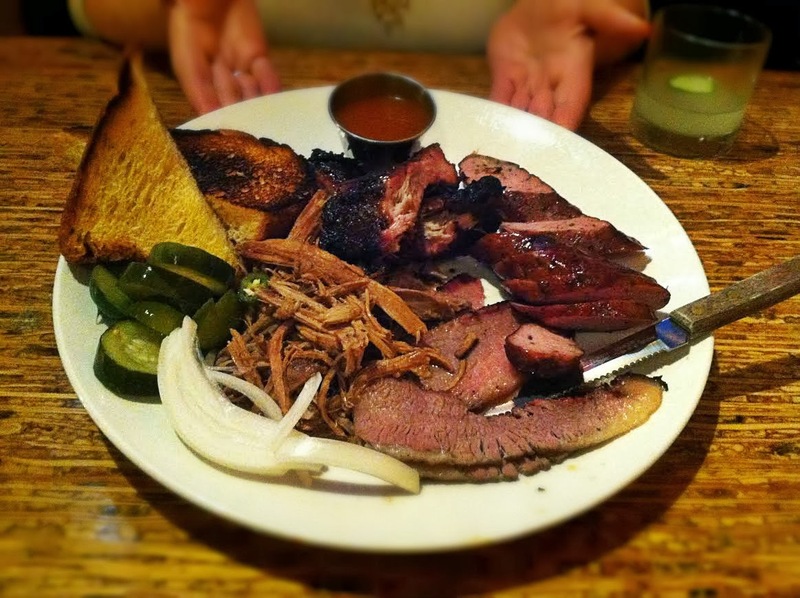 Courtney's barbecue Smoker Sampler was pretty good as well. Not the best barbecue I've ever had (though I'm not really sure what the best barbecue I've ever had is), but it definitely had a nice variety of offerings: Pork ribs, beef brisket, Carolina vinegar pulled pork, and half a link of sausage. And let me tell you, the sausage was phenomenal. I think it was some sort of jalapeno sausage. Whatever it was, I could have had 8 links of it as my whole meal. Apologies for that visual. I just grossed myself out too so you're not alone. I loved Beaver's so much, and I really am baffled it took me almost a year to finally get there. The environment is quirky, casual, and utterly pleasant, and the food is a surprisingly creative, delicious, and flattering homage to down-home Houston food. I bet my BFF David Cordúa would totally agree.